Galette is very popular western dish. This is a open type of pie. There are a lot of variations of Galette created by varying the fillings. 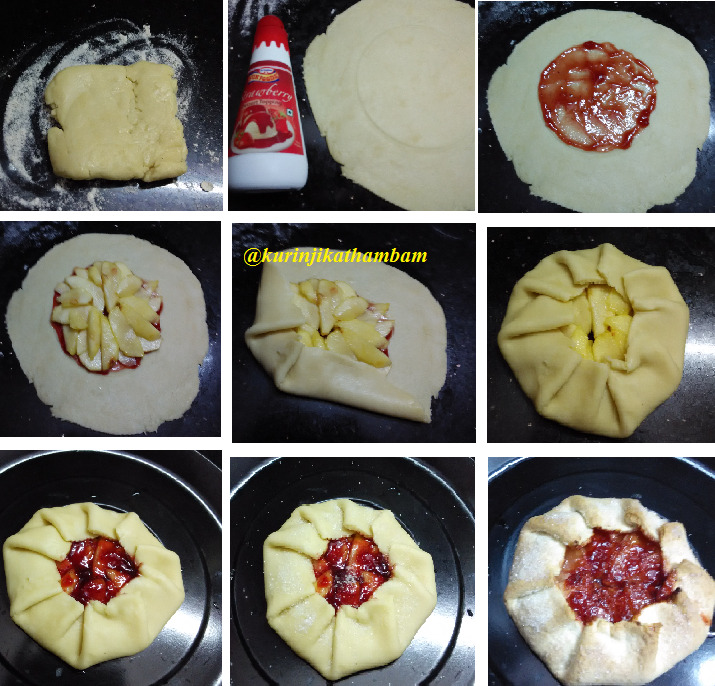 I have used apple and strawberry to make a sweet Galette. 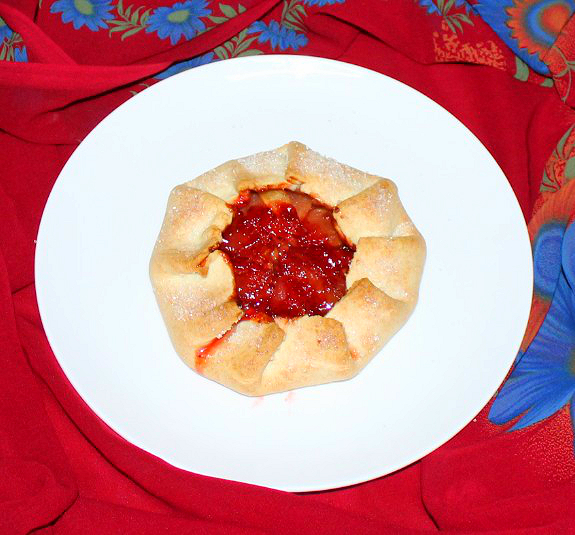 We can also create a savory Galette by filling spicy fillings like pizza. 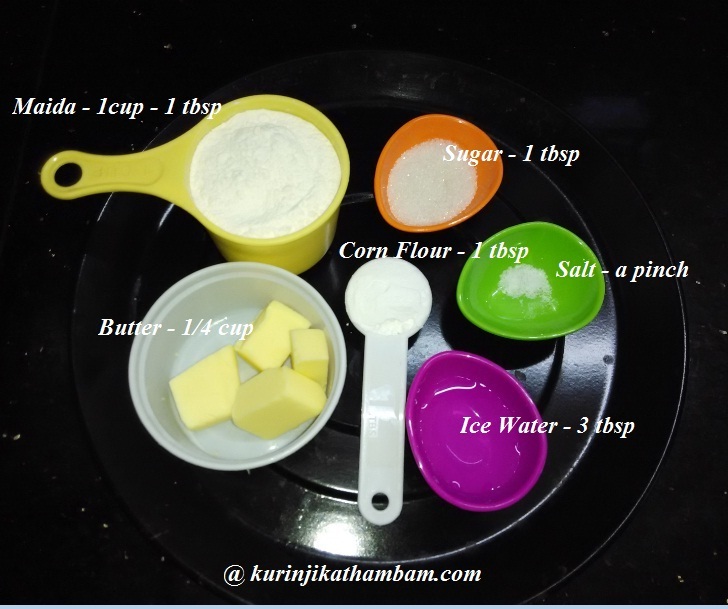 I have prepared this as part of this month event in Baking Partner facebook group created by Swathi. 1. Add maida, corn flour sugar and salt in a food processor (mixie). Just pulse 3 -4 times only. 2. 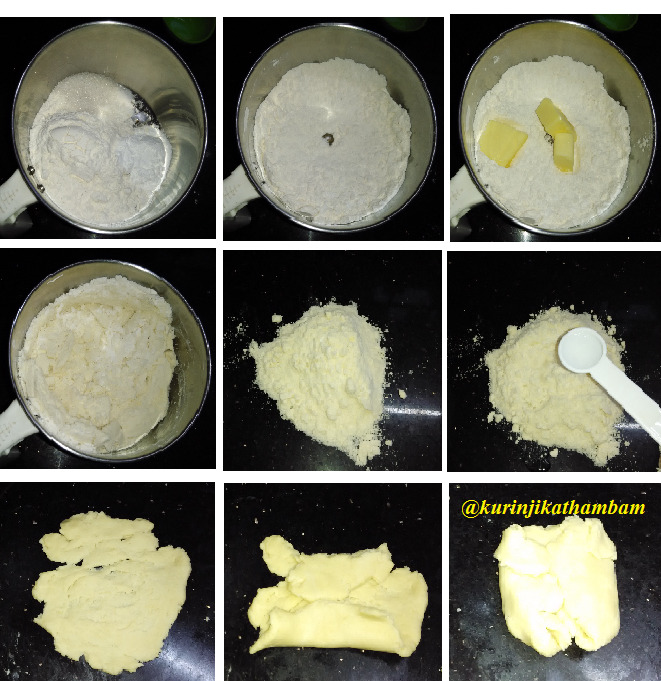 Now add the chilled butter and again pulse the flour 3 -4 times or till the flour looks like bread crumbs. 3. Put the flour mixture on the work surface or wide bowl. Then add cold water little by little and make it into a soft and smooth dough. ( I have used 3 tbsp of water). 4. Now using your palm make rectangular shape from the dough. 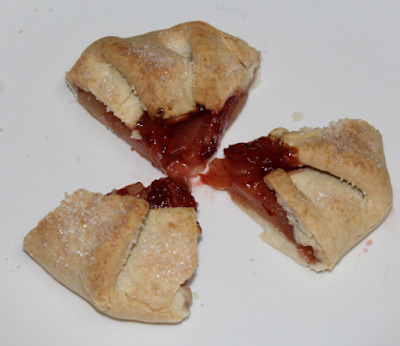 Then fold the top side of the dough to the middle, then fold the bottom side to the middle. Then fold the left side to middle and right side to middle. Should become like a envelope as shown in fig. 5. Now cover and keep this dough in a fridge for ½ an hour. 1. Remove the skin of the apple and cut it into thin lengthwise slices. 2. Heat the butter in a pan, then add sugar when butter starts to melt. 3. Add 1 tbsp of water and mix them well. Wait till the sugar melts completely. 4. Now add the apple slices and mix them gently. 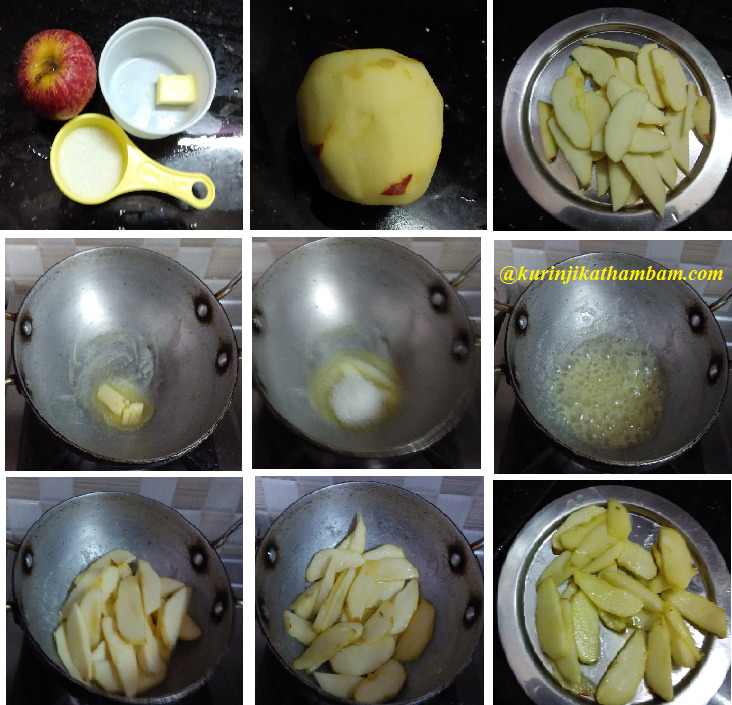 Cook for 2 mins or till all the slices are coated by the butter mixture. 5. Take it out from the pan and allow it to cool down. Keep it aside. 1. Preheat the oven for 2000C for 10 mins. 2. 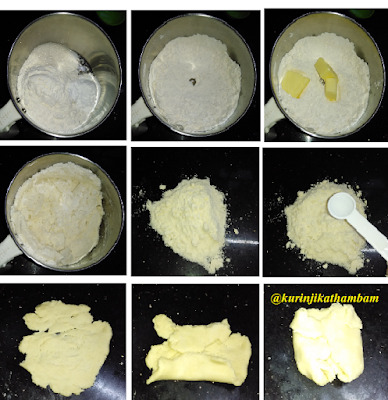 After half an hour remove the dough from refrigerator and roll it into a circle (3 mm thickness) on the work surface with little flour. 3. Now draw small circle at its center. Ensure that the difference between outer circle and inner circle is minimum 3 inches. 4. Now apply jam at the center circle. I have used strawberry dessert topping instead of jam. 5. Then arrange the apple slices at the center circle in a single layer. 6. Now fold the edges towards the center of the circle to form a petal. Press them gently to make them stick together. 7. Again I filled the circle with strawberry topping. This is purely optional. 8. Now transfer this into baking tray and sprinkle sugar on the top of the galette. 9. Bake at 1800C for 30 mins or till the Galette becomes golden color. Allow it to cool down completely and cut it into small pieces and serve. 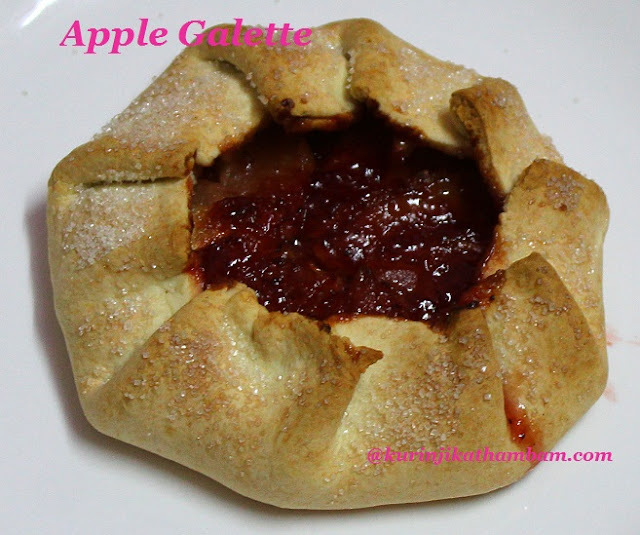 Very nice galette, love this fruit filling idea.